OKLAHOMA CITY (AP) Another second-half collapse, another round of questions about Oklahoma City’s finishing power. 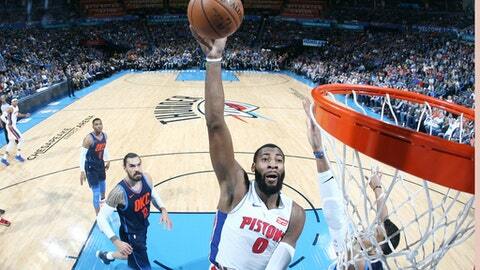 After dominating defending NBA champion Golden State from start to finish two days earlier, the Thunder wasted a big lead in a 99-98 loss to the Detroit Pistons on Friday night. Oklahoma City had a 10-point lead at the half and was up 15 midway through the third quarter before the Pistons stormed back, led by center Andre Drummond and bench players Ish Smith and Langston Galloway. Detroit grabbed the lead for good midway through the fourth quarter and the Thunder missed 14 of their last 20 shots, including a final 27-footer by Russell Westbrook in the final three seconds that left Oklahoma City a point short. Westbrook had his sixth triple-double of the season for Oklahoma City with 27 points, 11 assists and 11 rebounds. He missed a long 3-point attempt on the final possession to finish 1 of 10 from 3-point range and 10 of 29 from the field. Oklahoma City had numerous chances, missing three shots on one possession in the final minute. It was the eighth double-digit lead given up by the Thunder this season on their way to a loss. Carmelo Anthony had 20 points for Oklahoma City, and Paul George had 16. Since the start of 2009-10 season, the Thunder have the fourth best overall winning percentage among the Big Four professional sports, trailing only the New England Patriots (NFL), San Antonio Spurs (NBA) and Green Bay Packers (NFL). Former Thunder guard Jackson made his first appearance in OKC after missing both meetings last season due to injury. Jackson was booed lustily in pregame introductions and in the first half of the game. His last appearance at Chesapeake Arena included a verbal altercation with a fan at courtside. Pistons: At Boston on Monday night.